Museum Thresholds is a progressive, interdisciplinary volume and the first to explore the importance and potential of entrance spaces for visitor experience. Bringing together an international collection of writers from different disciplines, the chapters in this volume offer different theoretical perspectives on the nature of engagement, interaction and immersion in threshold spaces, and the factors which enable and inhibit those immersive possibilities. Organised into themed sections, the book explores museum thresholds from three different perspectives. Considering them first as a problem space, the contributors then go on to explore thresholds through different media and, finally, draw upon other subjects and professions, including performance, gaming, retail and discourse studies, in order to examine them from an entirely new perspective. Drawing upon examples that span Asia, North America and Europe, the authors set the entrance space in its historical, social and architectural contexts. Together, the essays show how the challenges posed by the threshold can be rethought and reimagined from a variety of perspectives, each of which have much to bring to future thinking and design. 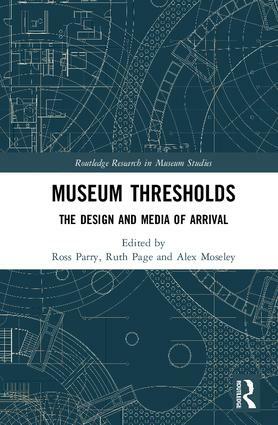 Combining both theory and practice, Museum Thresholds should be essential reading for academics, researchers and postgraduate students working in museum studies, digital heritage, architecture, design studies, retail studies and media studies. It will also be of great interest to museum practitioners working in a wide variety of institutions around the globe. Ross Parry is Deputy Pro-Vice-Chancellor (Digital) at the University of Leicester (UK), and associate professor in its School of Museum Studies. For over twenty years, his interdisciplinary and highly collaborative research has considered the relationship between digital media and the cultural heritage sector. A former national chair of the UK’s Museums Computer Group, and a Tate Research Fellow, he was one of the founding Trustees of the Jodi Mattes Trust – for accessible digital culture. He is the author of the book Recoding the Museum (the first major history of museum computing) and Museums in a Digital Age – a volume that helped define the subject area of ‘digital heritage’. Ruth Page spends her time teaching and writing about storytelling, especially focussing on the stories that people tell in social media contexts. She has written several books including Stories and Social Media (Routledge, 2012), Narratives Online: Shared Stories and Social Media (2018), and was the lead author of the student textbook, Researching the Language of Social Media (Routledge, 2014). Her publications in journals and edited collections have explored narratives in a wide range of contexts, from print literature and the mainstream media to conversational stories and stories published in online contexts such as blogs, social network sites and Wikipedia. Alex Moseley is a National Teaching Fellow and Head of Curriculum Advancement at the University of Leicester. He has had long experience as both practitioner and researcher of course design and development for higher education and also teaches innovative Digital Media courses in Museum Studies and Historical Studies. His principal research area is in games-based learning: he has written widely in this area including Using Games to Enhance Teaching and Learning (Routledge, 2012) and New Traditional Games for Learning: A Case Book (Routledge, 2013), has designed and consulted on a number of games for museum and education contexts, chairs the Association for Learning Technology special interest group on Playful Learning, and co-organises the Playful Learning conference.